Originally published in GemGuide in 2016, this comprehensive series examines the quality factors that influence the value of colored gemstones, with a specific emphasis on the role cut quality plays in determining the value of faceted gems. 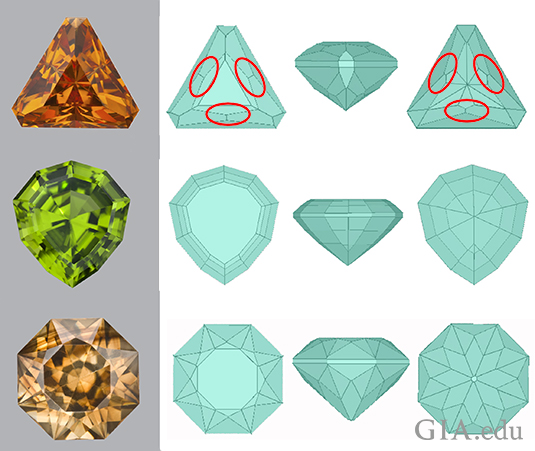 GIA researcher and cut expert, Al Gilbertson, examines the elements of cutting, investigates the choices and tradeoffs a cutter makes and why, and provides guidelines for assessing various aspects of cut quality for colored gemstones. This web version of the original series is divided into five separate articles and reflects minor stylistic edits to the original. Wireframes or depictions of facet arrangements (such as Fig. 5-08) are from scans of real gems so as to illustrate certain aspects of gem cutting. Face-up patterns (such as Fig. 5-03, right) were made using the program DiamCalc; adjustments were made to the refractive index to represent the gem material being demonstrated. DiamCalc cannot show double refraction. In this fifth and final installment in our series on cut’s impact on colored stone values, we explore craftsmanship’s bearing on cut quality. Craftsmanship is a broad term that denotes how much attention to detail the cutter gave to the finished gem. Most colored gemstones are cut in a variety of fancy shapes with many facet variations. Because of that, some aspects are less critical than others. Minor deviations of craftsmanship aren’t as critical as achieving the optimal color. However, very careful attention to detail is rewarded by being able to demand a higher price. As the general value of the type of gem goes up, this becomes truer. 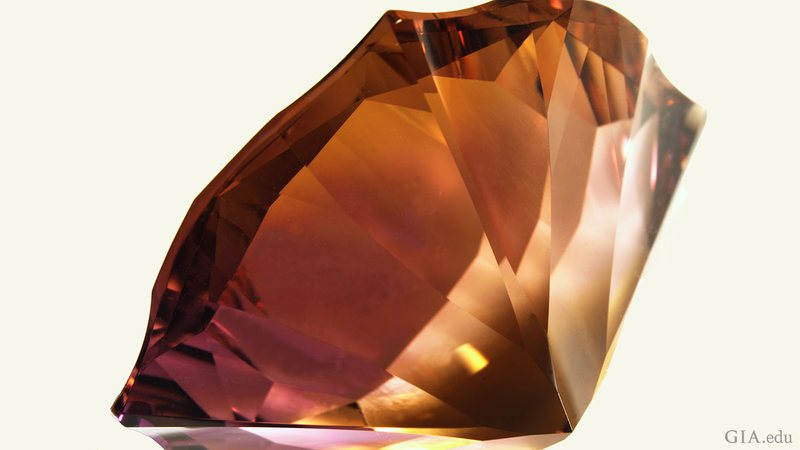 A very well-cut richly hued citrine will not get as much added benefit as a tourmaline with very exceptional color. Yet with very rare and expensive gems, this becomes less true, e.g., a very well-cut and fine-colored sapphire will only benefit slightly from exceptional cutting. There are a number of elements that fold into craftsmanship which significantly impact value. Outline. The outline, or shape, of the stone should be graceful and pleasing, and symmetrical when appropriate. A finished gem of exceptional cut, color, or rarity can get away with a less pleasing shape provided it is still symmetrical (see Fig. 5-01, row 1). The cutter can choose to recover significant weight from the rough of what they consider an important gem. 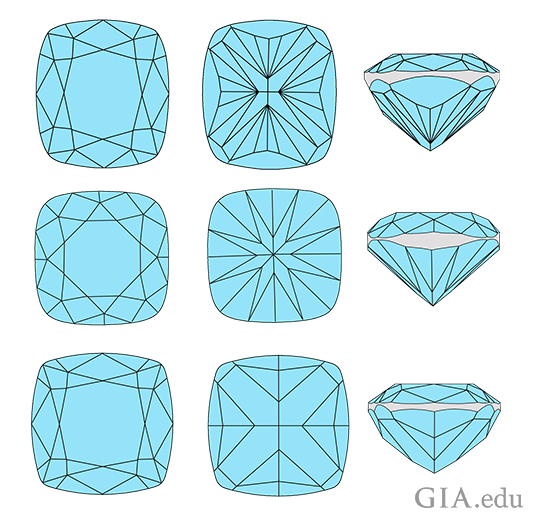 The value per carat may be less for that same stone if the outline lacks symmetry (see Fig. 5-01, row 2), but the weight saved may make it a gem that sells for more than one of average color or size. Table. The table should be centered, parallel to the girdle, and follow the general shape of the gem. A rectangular table on an oval gem looks out of place (see Fig. 5-02). Usually, there is an optimal table size for the best appearance for any facet arrangement, and the relative size will vary depending upon a number of factors (see Fig. 5-03). Depending on the facet arrangement, gems with large tables can display windowing. Very small tables are generally less desirable, and surprisingly, do not minimize windowing. Greater crown height retains more weight creating the perception that the gem is top-heavy and pointed. A cutter can choose to cut a dark gem with a large table rather than cut several smaller gems. In extremely dark gems, a large table with shallow proportions can be preferable to a gem that is extremely dark, since it lightens the color to a range that sells for more. Shoulders. Shoulders on hearts, ovals, and pears that look pinched are less pleasing (see Fig. 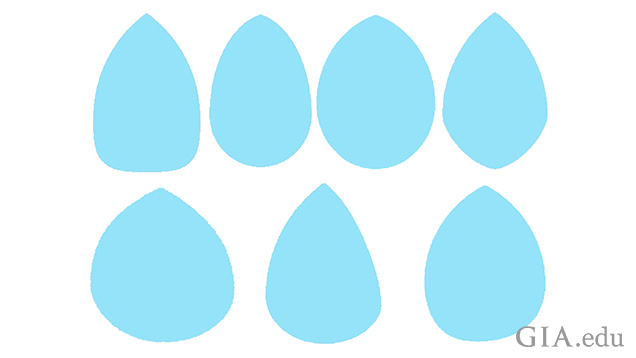 5-01, row 1, fourth pear shape). Broad shoulders are acceptable if the overall outline is still pleasing. Culet or Keel Line. 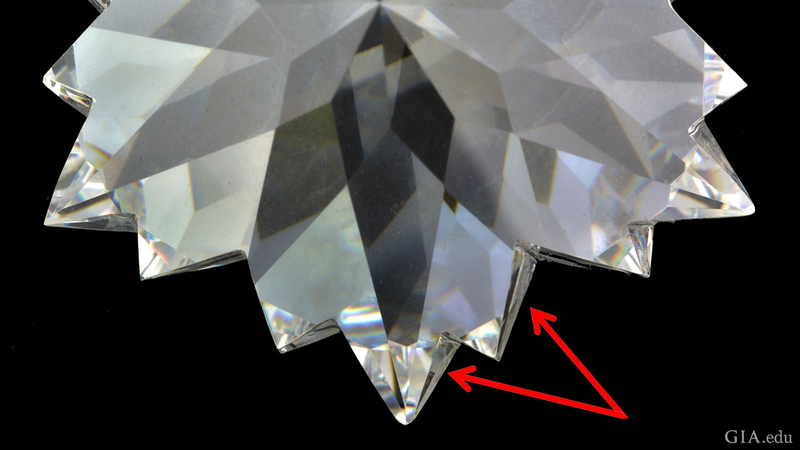 The culet or keel line of the bottom of the gem needs to be centered (see Fig. 5-04). The more visibly off-center, the more it affects the perception of how well the gem was cut. General Symmetry. 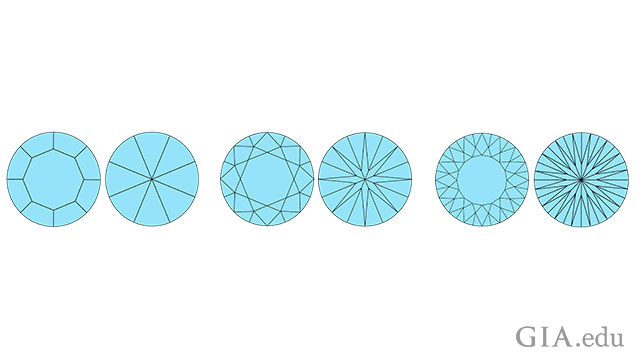 Looking at the gem face-up, mentally divide it into halves or quarters (fifths if it is a pentagon, etc.) and look at how each segment mirrors the others. 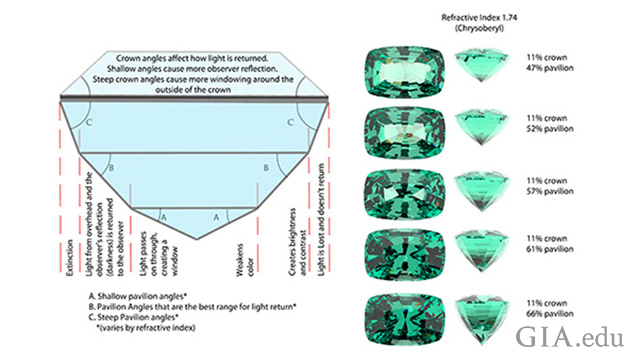 If there is an impression of a significant deficiency in how they match up, this will also affect the perception of the cut quality, and ultimately the gem’s value (see Fig. 5-05). Girdle Thickness and Unevenness. 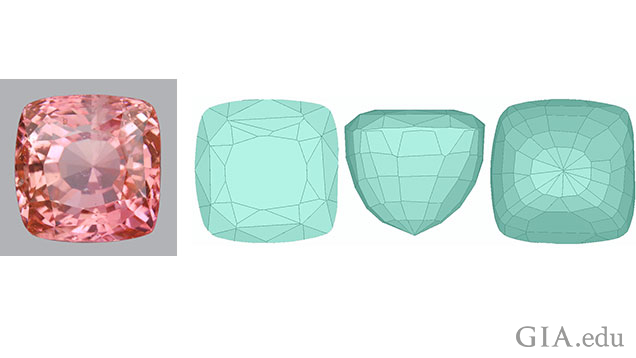 Girdle thickness rarely affects a gem’s face-up appearance. Extremely thin girdles should be avoided as they are very easily chipped. While corners and points (tips) are vulnerable to chipping, slightly thicker girdles at these spots are acceptable to help mitigate their vulnerability. Extremely thick girdles are difficult to set and obviously add unnecessary weight. Extreme unevenness can be an important intentional part of a designer cut where certain areas of the design require a thicker portion of the girdle (e.g. corners on cushions) (see Fig. 5-06). This doesn’t detract from the value as much when it is required for the cutting style. Other types of extreme unevenness or waviness also lower the perception of the gem’s cut quality and ultimately its value. Girdles with Sharp Edges. Nathan Renfro (Analytical Manager, Identification, GIA) points out that some cutters round the girdle edges so that they are less likely to chip when being set. This means that the girdle may not come to a sharp edge where it meets the crown or pavilion and that the girdle itself may not be flat. Polish. 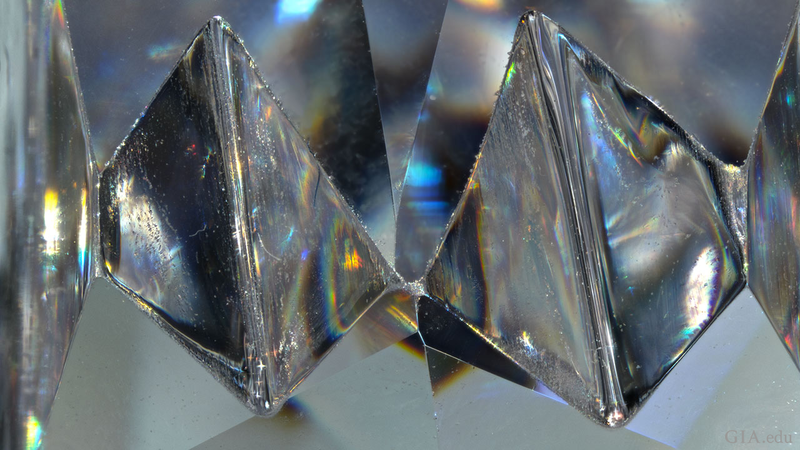 The late Stephen Kotlowski (Uniquely K Custom Gems) noted that all of the facets should look like they are highly polished with a mirror-like quality, and this polish quality should be examined under magnification. Poor polish means less value. Alignment of Crown and Pavilion. With certain facet arrangements (e.g. step cuts, designer cuts), better crown and pavilion alignment is an indication of higher level cutting quality. Many standard oval, pear, and cushion shaped commercial-cut quality gems can get away with less than perfect alignment, unless it makes the girdle extremely uneven. In hearts, poor alignment can be seen in angular or mismatched lobes, and shallow or deep or awkward clefts (see Fig. 5-07). Often these deficiencies can be slightly masked by the design of the jewelry. Facet Meets. With designer cuts (see Fig. 5-08) it is more important and fairly expected that the facets should meet in sharp points with each other, according to Stephen Kotlowski. Some designs will purposely have portions without standard meets, so be careful not to be overly critical (see circled areas on the triangle in Fig. 5-08). Outline, facet symmetry, and polish are more important than the exactness of the facet meets. Rounded Facet Junctions. Ideally, adjoining facets should have sharp junctions. 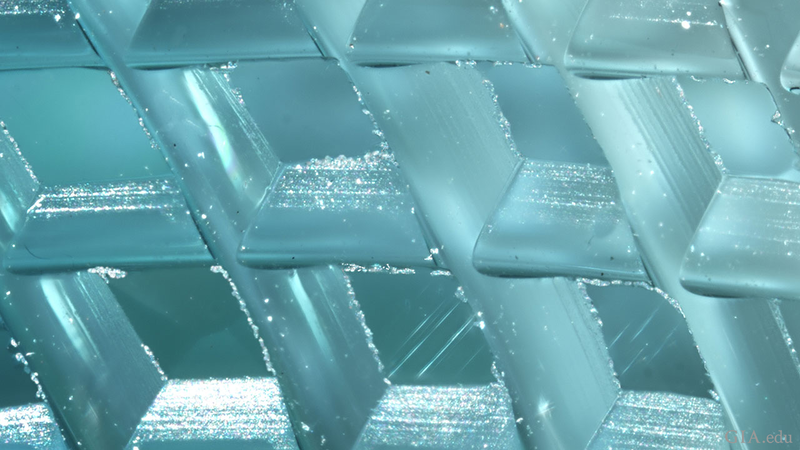 However, it is not uncommon to see slightly rounded facet junctions in commercial grade cutting. Unless this slight rounding is eye-visible, it seldom detracts from the value of the gem, but it should. The difference between stones with sharp flat facet junctions and those with very slightly rounded facet junctions is notable. The flat facets and sharp edges add crispness to the appearance that cannot be achieved otherwise. The extra time needed to add this care when cutting justifies a significant difference in cost for a designer gem. Facet Number and Size. 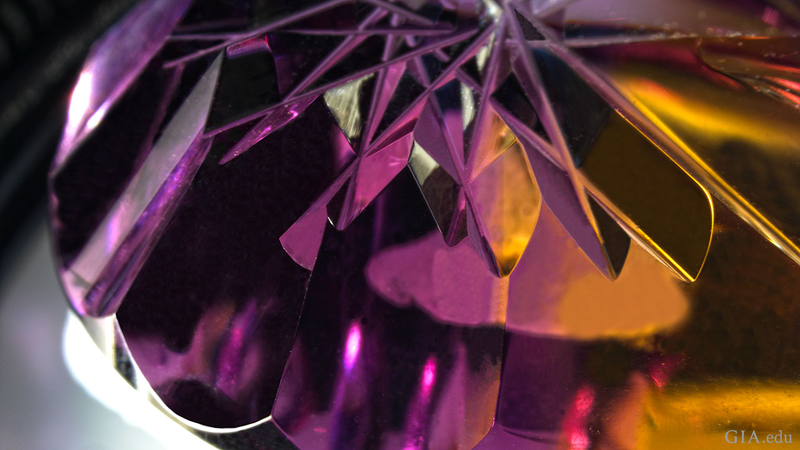 Cutters agree that the total number of facets is relative to the finished size of the gem. 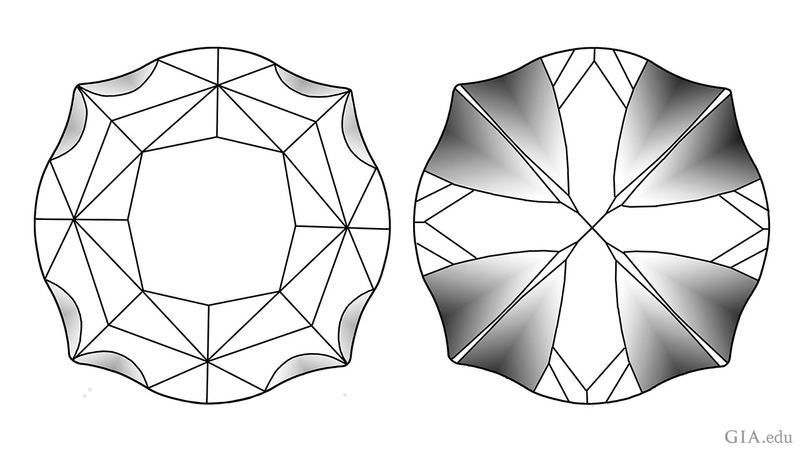 Figure 5-10 shows three very different facet arrangements for a round gem. The first, with only 17 facets, is best utilized on small gems, generally under about 3 mm. More facets than that on such small gems will start to blur the effect of the faceting and be less interesting, especially if the material is strongly doubly refractive. The second example with 57 facets is great for sizes from about 4 to 11 mm. This facet pattern will be less interesting or dynamic on larger sizes. Gems larger than 12 mm really need more facets, such as the third diagram with 113 facets. 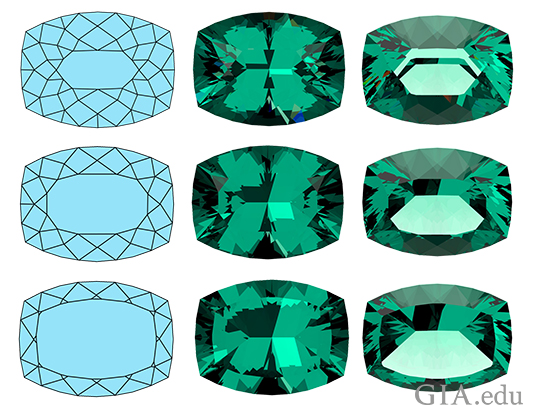 Note that emerald cuts don’t suffer when cut in all of these size variations. 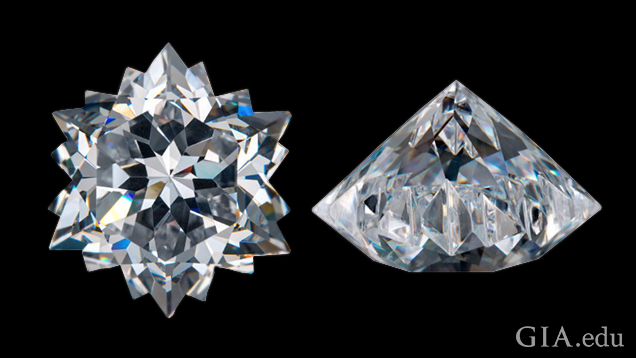 Wayne Emery points out that the relative size of the facets, especially on the crown, is important to a pleasing design. There are some designs that split the star or upper girdle facets into several small facets, while leaving the crown mains large. At first glance, this type of cutting will result in a disappointment. Crown facets need to be evenly sized not only to keep the color more evenly spread, but to create a better face-up appeal. Proportions. Proportions affect the face-up appearance of the gem in general, so calling out proportions any more than this article series already has is unnecessary (see Fig. 5-11). Bulge. Bulginess (see figure 5-05) in the pavilion or crown sacrifices the face-up beauty of a gem while adding significant excess weight (even up to 35% and more). 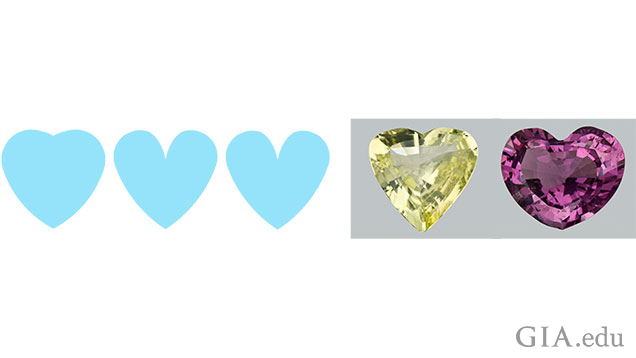 Often the jeweler pays less per carat for the less attractive, deep, bulgy gem. It is not unusual for jewelers to want to re-cut a damaged or poorly cut gem. Re-cutting requires determining the added expense versus the recovered weight to see if it is worth the effort (don’t be surprised at substantial weight loss). Not all cutters have the same philosophy about how a gem should look when it is re-cut. Will they re-polish an older style step-cut cushion without changing the angles substantially, resulting in that older classic appearance? Or, do they want to use a modern cutting style and will the resulting face-up appearance match a consumer’s expectations? Get recommendations from others who have used their services, ask what they deem appropriate for the gem, and view examples of their work. 1. Finish. 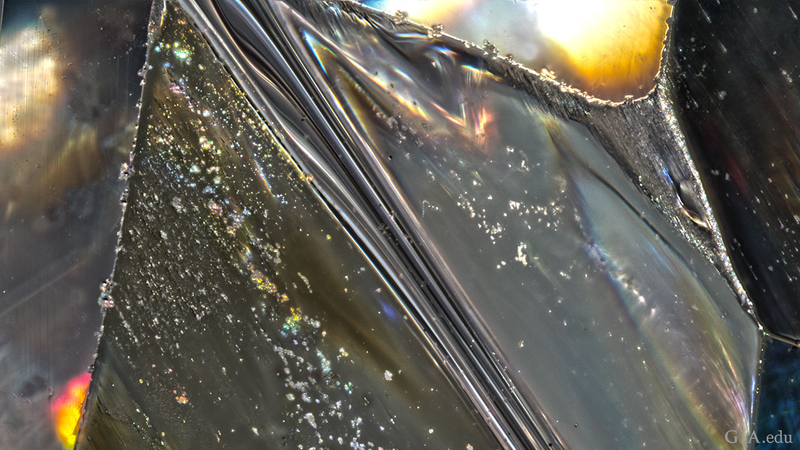 Using a loupe, look at the inside of the facets and grooves or concave areas. Mass-produced work or lesser quality work will often have chipped edges and grooves from the cutting tools that haven’t been polished out (see Fig. 5-12b). Sometimes there may be pockmarks because the polishing did not remove the earlier grinding done with coarser grits (see Fig. 5-12c and 5-15d). 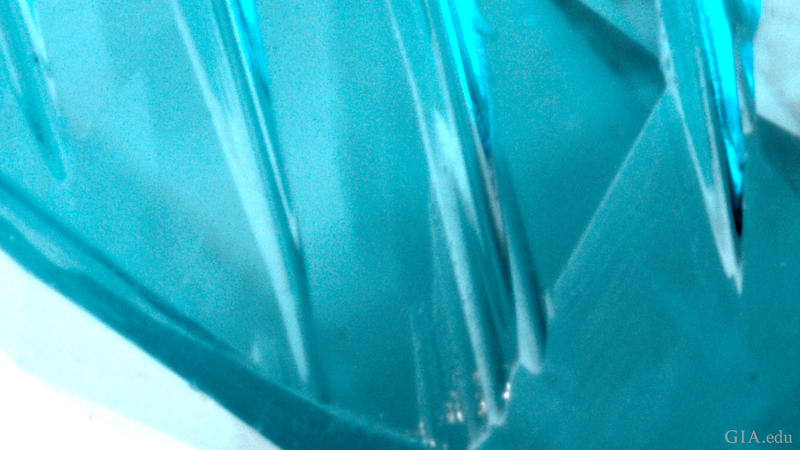 Distorted polished surfaces are common with lower quality goods (see Fig. 5-15d). The edges of where the concavities meet the facets should be sharp-edged and free from chipping (see Figs. 5-13b and 5-13c). The surfaces should all have a very high, even polish. Figure 5-12. 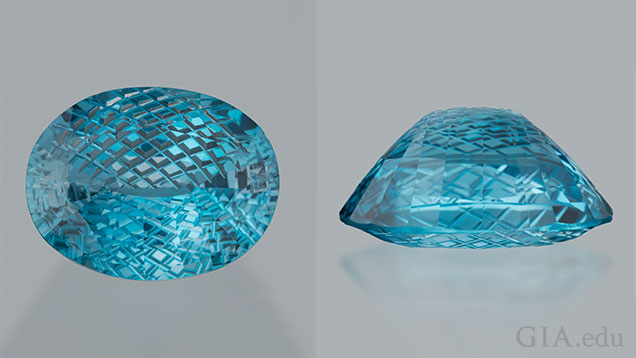 Oval blue topaz shows indications of lesser cutting quality and/or mass-manufacturing. Figure 5-13. 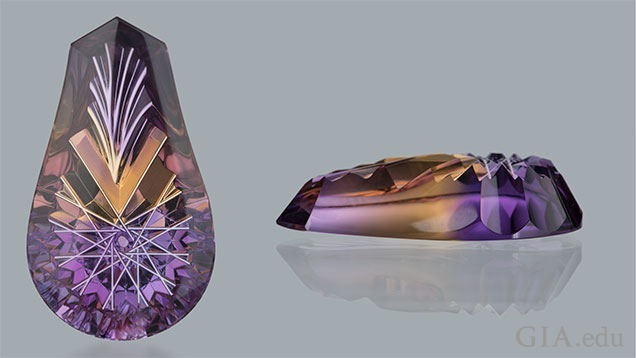 This drop-shaped ametrine is an example of a high quality fantasy cut. Cut by Dalan Hargrave. 2. Central brilliance. Since the purpose of facet reflections is to enhance the brilliance and visual interest of the gem, concave faceting works very easily with round gems, as it brings the visual interest to the center. For odd shaped gems, this centrality of focus is harder to achieve, but can still be used to accent a portion of the gem (see Fig. 5-14). 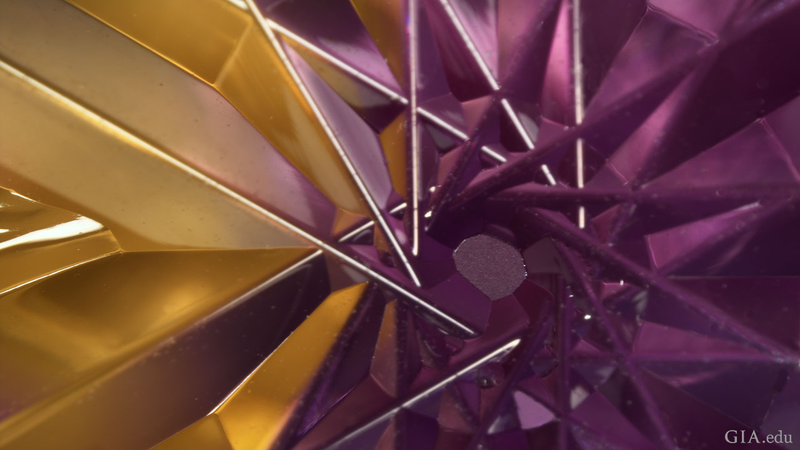 These reflections are playing with optics or using light in a new way in a particular gem material to create strong contrast patterns. The effect should enhance the “central brilliance” of the gem and make interesting patterns. Fig. 5-14. Sunstone and tourmaline. Cut by John Dyer. Photo: John Dyer & Co. The application of a few grooves on the pavilion or at the edge of the gem is easily done and mass-produced, while applying them in a way that provides a visually vibrant pattern with central brilliance takes more artistic ability and work. Even the freeform sunstone from Figure 5-14 has optical dishes placed in a manner that points the eye to the central green area. Without these dishes, the sunstone would be less visually interesting. Central brilliance can also be symmetrical, so that if you were to fold the gem in half, one side mirrors the other (called line-symmetry). 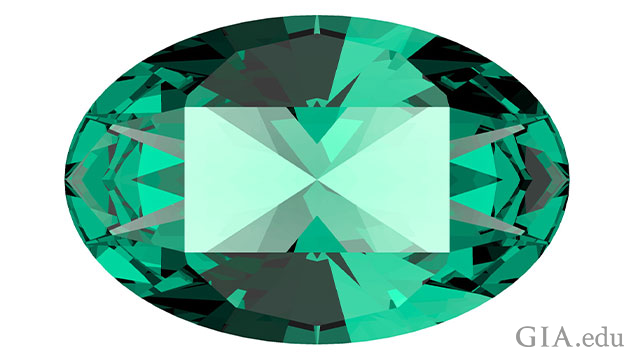 The long rectangular tourmaline in Figure 5-14 has a line-symmetry type of brilliance. Central brilliance is not seen in all fantasy items, but when present enhances the face-up appearance of the gem. Figure 5-15. Star-shaped cubic zirconia. Cut by D.K. Kim. 3. Symmetry of Groove Placement. Grooves and concavities that are symmetrical or laid out in a well-developed pattern not only enhance the central brilliance, but show a consistency even under magnification. 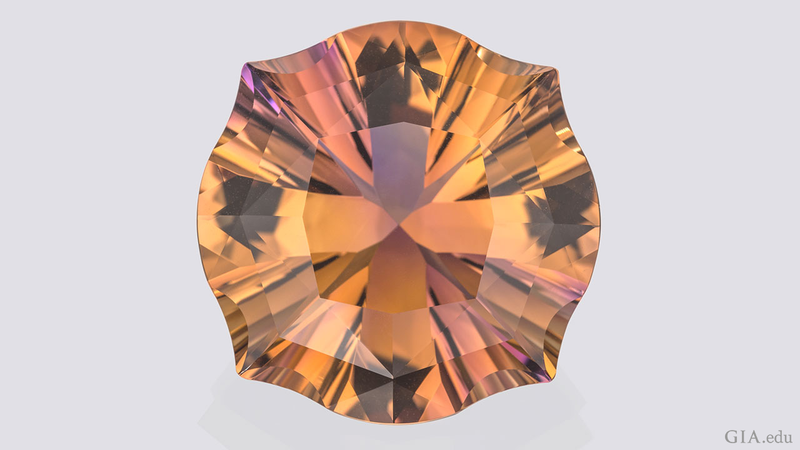 The sunstone of Figure 5-14 does not have symmetrically placed optical dishes, whereas the concave facets in the tourmaline in the same figure have a high level of symmetry. Added symmetry adds more value. Figure 5-16. Line drawing of facet and groove surface arrangement for an ametrine cut by Chris Wolfsberg. Faceting is a series of compromises. The cutter compares various tradeoffs to make decisions about cutting the final gem. Most importantly, the cutter needs to achieve the best face-up color possible from that gem. The shape (outline) needs to be aesthetically pleasing and desirable, while the quality of the cutting should provide an attractive contrast pattern that enhances the color. Many jewelers and gem dealers haven’t taken the time to understand the difference between good gem cutting and great gem cutting. With a little effort, it is always possible to detect the hand of a dedicated artisan in their creation. We often sacrifice values of real craftsmanship at the altar of “good enough.” In a world that places a premium on low price, disposable goods, and speed of getting things done, craftsmanship suffers. Even though we are able to quickly realize the quality of something that has been expertly cut, many often choose the cheap and average gem instead. Diamonds have gone through a bit of commoditization over the years, and much of the public and most of the trade is keenly aware of price ranges for certain goods. High quality cutting in diamonds is now appreciated. Prices for colored gems are very blind to the public and even many jewelers, so quality can be sacrificed and sellers can purport fictitious “good deals.” It’s time to set good enough aside. Expert craftsmanship comes from creativity, and a passion and attention to detail that improves over the length of an artisan’s career. Too often the jewelry trade thinks the work of highly skilled professionals is too expensive to sell. But a jeweler’s passion for quality and her knowledge and discernment gets passed along to her customer, fostering an attitude that says good enough is not good enough, and creating demand for quality products. In a world that seems to want to treat all of us the same, people struggle to point out their own uniqueness. Some do it by their clothing or lifestyle, others by what they drive. Why not help consumers demonstrate uniqueness through the quality of the fine gems they wear? Handling and selling quality craftsmanship is at the heart of getting out of the rut of good enough. It’s also key to earning the respect of clients and customers, and ultimately creating friends (your clients) who appreciate fine quality. © 2016 Gemworld International, Inc. All rights reserved. Permission granted for GIA to publish this at GIA.edu. Al Gilbertson is the Project Manager, Cut Research at the Gemological Institute of America Laboratory Carlsbad. Prior to joining GIA, Gilbertson served on the the American Gem Society (AGS) Cut Task Force, where he made significant contributions, including developing a patent which was acquired by AGS as the foundation of their ASET technology for cut grading. Hired by GIA in 2000, he became part of the research team that created the GIA cut grading system for round brilliant diamonds. Gilbertson is also the author of American Cut—The First 100 Years. Thanks to Wayne Emery (The Gemcutter), Brooke Goedert (Sr. Research Data Specialist, GIA Carlsbad), Josh Hall (Vice President of Pala International, Inc.), Dalan Hargrave (Gemstarz), Richard Hughes (Lotus Gemology), Stephen Kotlowski (Uniquely K Custom Gems), Andy Lucas (Manager, Field Gemology-Education, Content Strategy-Gemology, GIA Carlsbad), and Nathan Renfro (Analytical Manager, Identification, GIA Carlsbad) for reviewing this article and providing valuable input. Parts one and two of this series appeared in GemGuide, January/February 2016, Vol. 35, Issue 1; parts three and four in March/April 2016, Vol. 35, Issue 2; part five in May/June 2016, Vol. 35, Issue 3. Note that the article does not use the term faceted in the title. However, the major thrust of this series is faceted gems. Part 1 of 5 in the series "Value Factors, Design, and Cut Quality of Colored Gemstones (Non-Diamond)" discusses the major value factors that affect the price of a colored gemstone. Part 2 of 5 in the series “Value Factors, Design, and Cut Quality of Colored Gemstones (Non-Diamond)” establishes a common language for discussing cutting styles, with a focus on basic faceting styles, and offers a short discussion on cabochons and beads. 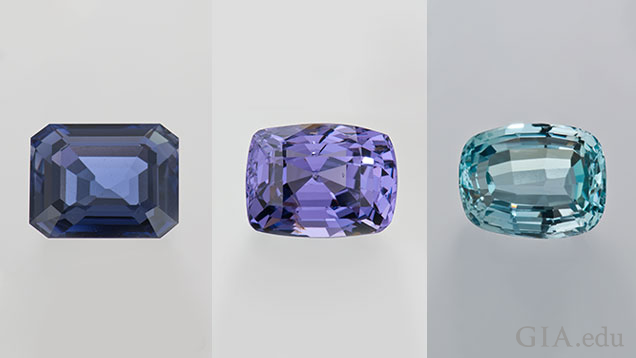 Part 3 of 5 in the series “Value Factors, Design, and Cut Quality of Colored Gemstones (Non-Diamond)” examines how cutting decisions can have a profound effect on a gemstone’s color quality. 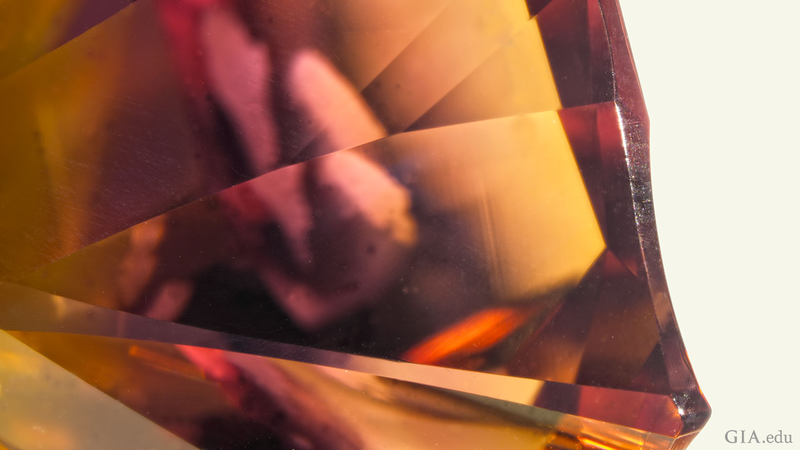 Part 4 of 5 in the series "Value Factors, Design, and Cut Quality of Colored Gemstones (Non-Diamond)" digs deeper into cutters’ choices and explores additional factors used in the trade to assess relative value. Download the comprehensive article "Value Factors, Design, and Cut Quality of Colored Gemstones (Non-Diamond)" featured in GemGuide.